Understanding the genetic structure and diversity of edge populations can shed light on the role of peripheral populations and their relevance for conservation strategies. 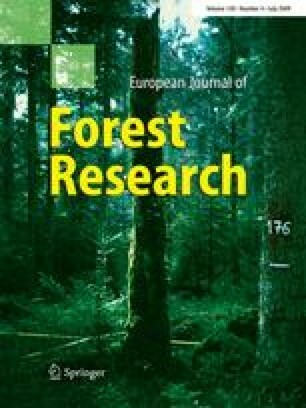 In this study, three fragmented and isolated Apennine populations of Scots pine (Pinus sylvestris L.) belonging to the rear edge of the species’ distribution were analyzed using both nuclear (nSSR) and chloroplast (cpSSR) microsatellites and were compared with an Alpine population belonging to the species’ main range. Although small population size and considerable isolation have probably reduced the genetic variability of Apennine populations, these fragmented populations maintain a high level of within-population genetic diversity. A significant among-population differentiation was found using both nSSR (F ST = 0.08) and cpSSR markers (ρ = 0.14). Analysis of molecular variance (AMOVA) on the nSSRs attributed all variabilities to the among Apennine populations component supporting the theoretical predictions regarding fragmentation effects on genetic structure. On the other hand, AMOVA on the cpSSRs attributed all variances to the between-region component and no differentiation was found within region, among the Apennine populations. This result suggests the importance of pollen gene flow in homogenizing populations on this geographical scale. Our results confirm the genetic distinctiveness of Apennine populations and their possible derivation from different glacial refugia than those of the Alps. Considering their peculiarity and the high level of intrapopulation genetic diversity that they still retain, fragmented Apennine populations should be considered of high priority for conservation. This research was supported by the project “Analisi genetica della popolazione di pino silvestre presente nel Parco storico di Monte Sole” from Parco Storico di Monte Sole. We wish to thank G. Maresi and B. Storti for help during field sampling, the members of Parco storico di Monte Sole for logistic support, M. Tomasi-Cormac and T. Say for correcting the English, S. Leonardi and P. Menozzi for suggestions and comments that improved the manuscript and two anonymous reviewers for their helpful comments and suggestions.